One of my favorite things about the holidays is crafting! I love to spend an afternoon at Hobby Lobby or Michaels picking up supplies to make something holiday related. Now that I have a toddler who has reached the stage where we need activities, I’m super excited to do crafts with her. 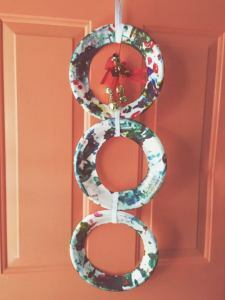 Note: A lot of these crafts require time in the kitchen with your toddler, so if you don’t already have a kitchen step ladder for your toddler, put one on your christmas list now! Here are 15 of the best Christmas crafts for toddlers! My toddler loves to paint, and so any craft that involves paint is a win for us! These cute little Christmas button trees can be displayed on your tree and only require popsicle sticks, buttons, white glue and a paint set. We used pom-poms, in addition to buttons, because my toddler has a fascination with those colorful little balls. This craft entertained her for quite a while and she of course loved to hang it on the tree when it was dried! I remember making these with my mom growing up, so when I came across this sweet, little holiday craft while searching for stuff to keep my rambunctious one-year-old occupied, I knew we had to make these together. This homemade cinnamon ornament recipe only calls for two ingredients: Apple sauce and cinnamon. Your toddler will love placing the cookie cutters (this is the set we use and love!) in the “dough” and will love decorating the ornaments with sprinkles even more. 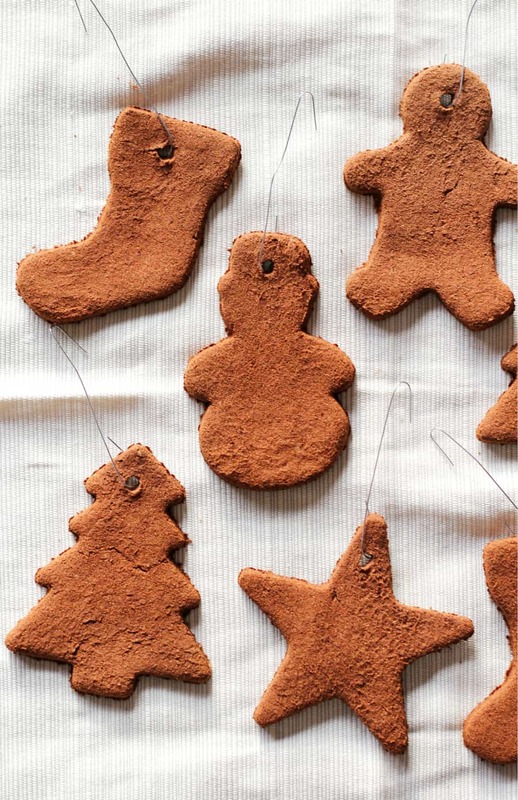 Oh, and your house will smell like yummy cinnamon Christmas for weeks after you make these! 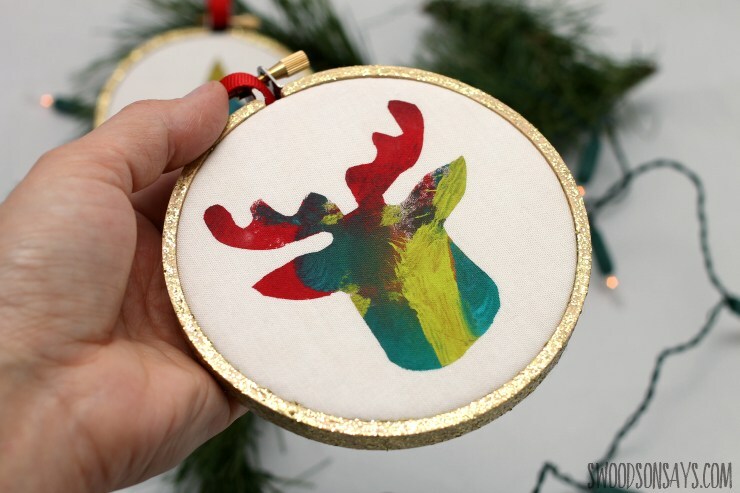 My toddler loves to finger paint, so these finger paint ornaments were a huge hit. 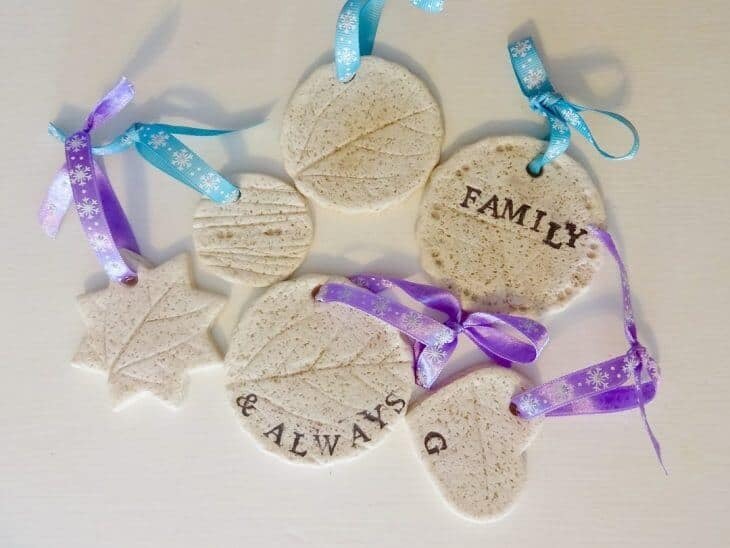 These do require so extra time from mom after your toddler is done with the finger painting process, but oh my goodness, these are the sweetest little ornaments ever! Be warned: Toddlers love finger painting, but it is messy– lay down a shower curtain or newspapers and make sure to always use washable finger paints and put a smock over your toddler’s clothes for easy clean up. If your toddler is Frozen-obsessed this snowman craft is going to make their day. Younger toddlers will need quite a bit of assistance with this, but will likely love placing the gooey eyes and fuzzy nose on the snowman. Don’t forget to save those paper towel rolls, mama! 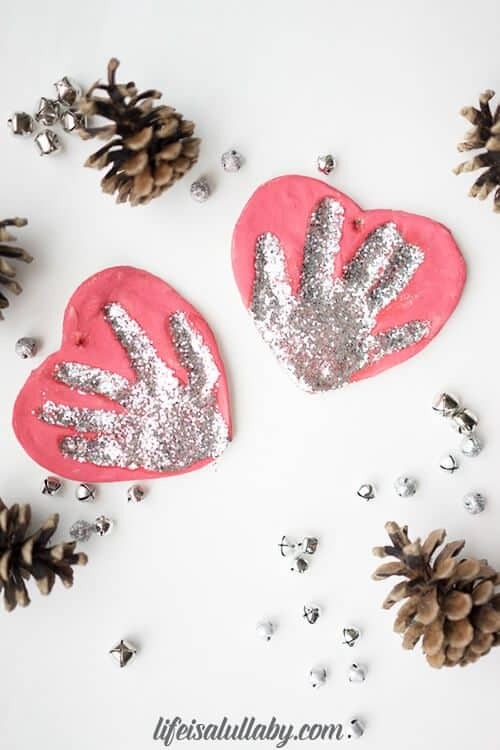 The sentimental side of me can’t say no to anything that involves my child’s handprint, so I couldn’t pass up this super cute salt dough hand print ornament. Looking for a way to send some holiday cheer to friends and relatives? Let your toddler make these adorable santa card crafts! If you have toddlers that like to craft you probably have all the supplies laying around the house, too. You’ll need card stock, googly eyes, red pom poms, cotton balls, paint and glitter. If your child is a fan of Polar Express or trains in general, this Polar Express jingle bell activity is sure to keep their attention! 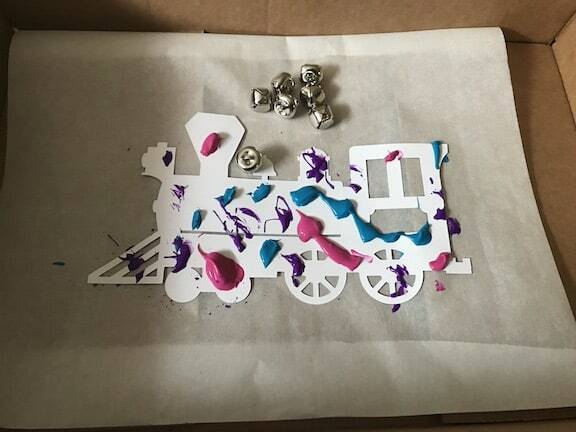 You’ll need to print and cut out a train prior to your tot doing this project, but other than that, this is one where they can break out their finger paints and have fun. 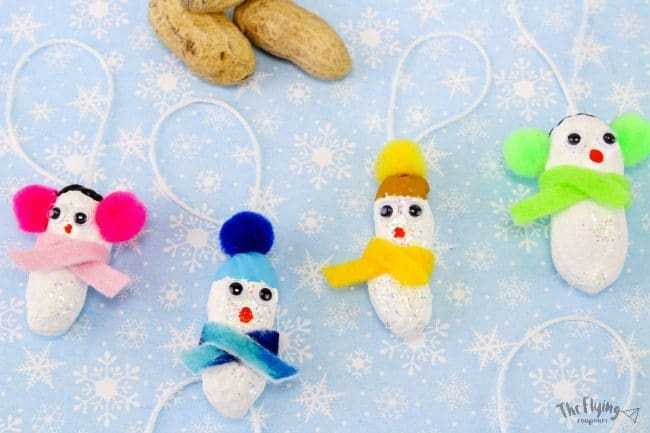 These peanut snowman ornaments are precious, and I’m telling you, your child will love to see their artwork displayed on your family tree. I’d go ahead and paint the peanuts ahead of time and then help your toddler put the eyes, nose, hat and scarf on. As soon as they’re dry let your toddler pick out a place to display them on the tree, make sure to get the camera ready, because it’s precious! 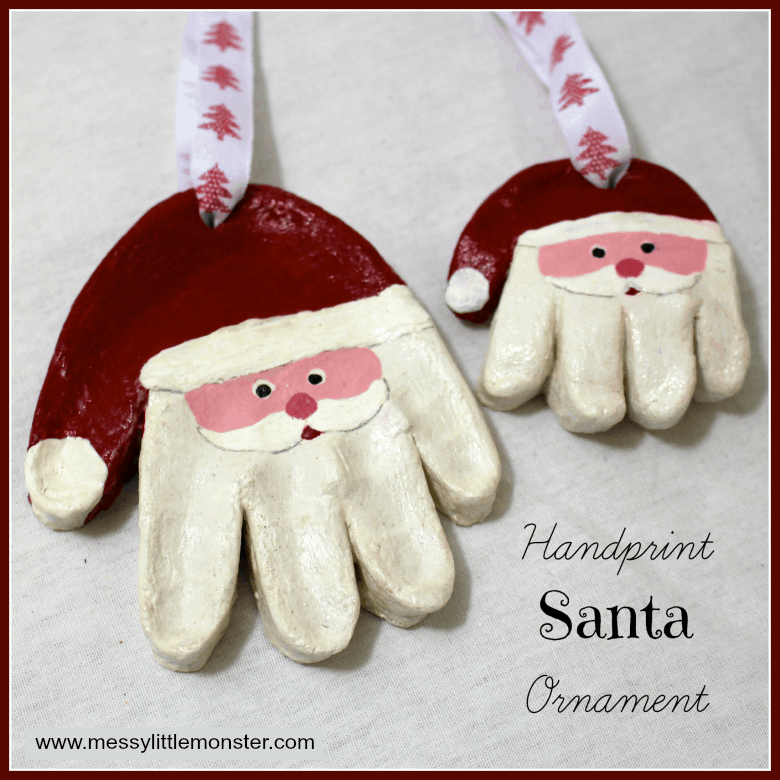 These santa salt dough hand print ornaments are the sweetest little crafts for tots! This is a great ornament to make year after year and work great as gifts to grandparents, too. 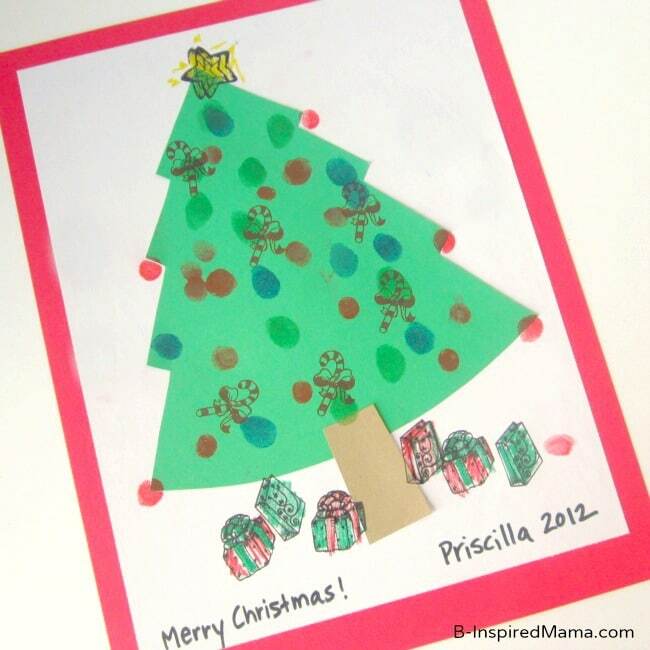 We use these ink pads for a lot of fingerprint crafts, so when I saw this adorable christmas tree craft I knew it would be on our holiday to-do list! After you cut out the tree, and help them stamp their finger prints, you can let your toddler go crazy with stickers, crayons or paints. 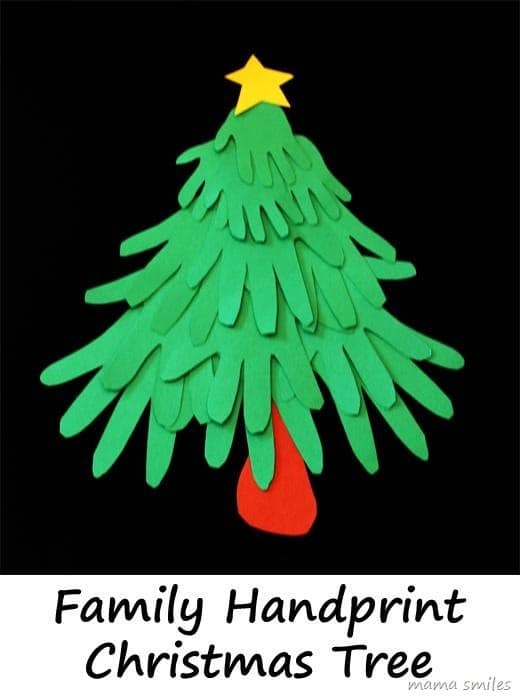 This family handprint Christmas tree craft is just the sweetest. What’s even sweeter is you can make this each year and your kids (and you) will love seeing how much their handprints grow each year. This is a great activity that you can probably complete without a trip to the store, as it only involves construction paper and glue! 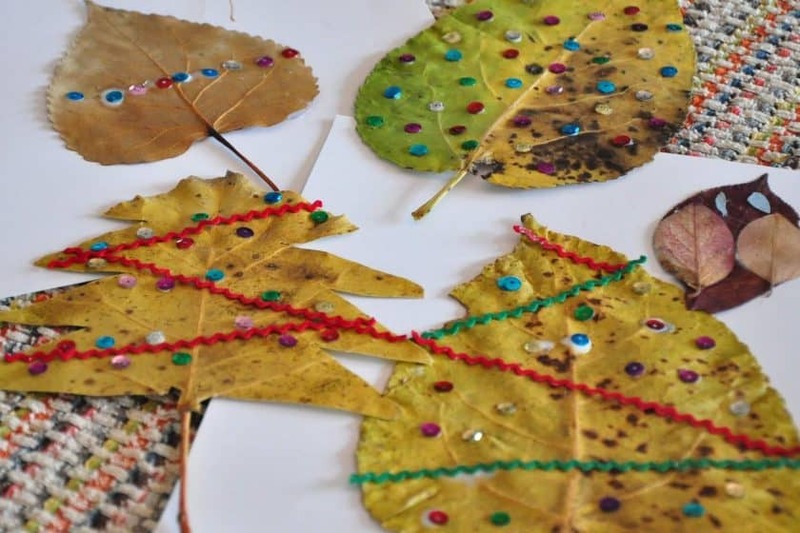 This leaf Christmas craft is a great activity and encourages kids to get outside, which is a win in my book. For younger toddlers, you could easily modify this craft by using pom poms and paint, too. 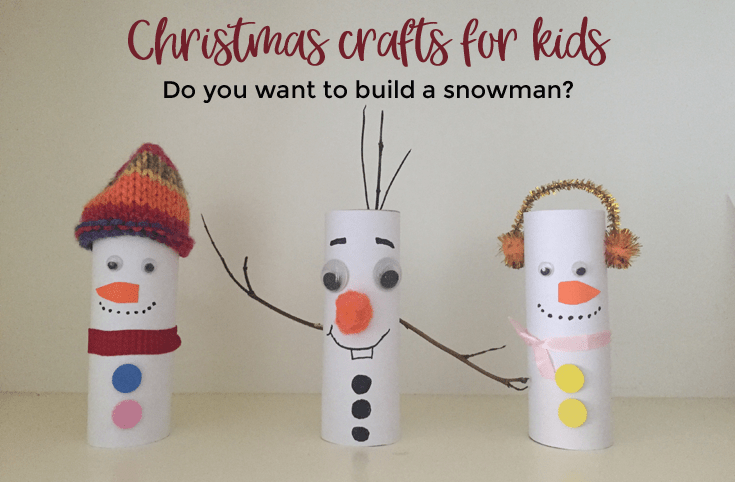 Looking for a good rainy day Christmas craft? 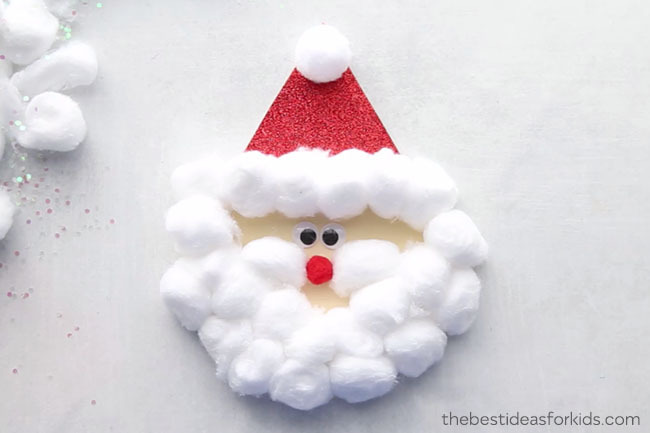 Break out the paints for this super cute DIY foam Christmas plate craft. The instructions say to “set the stage” by putting down a shower curtain to catch any paint splatters, and oh my goodness that is a great idea. Toddlers love to paint, and mostly paint themselves, so the shower curtain trick is great. 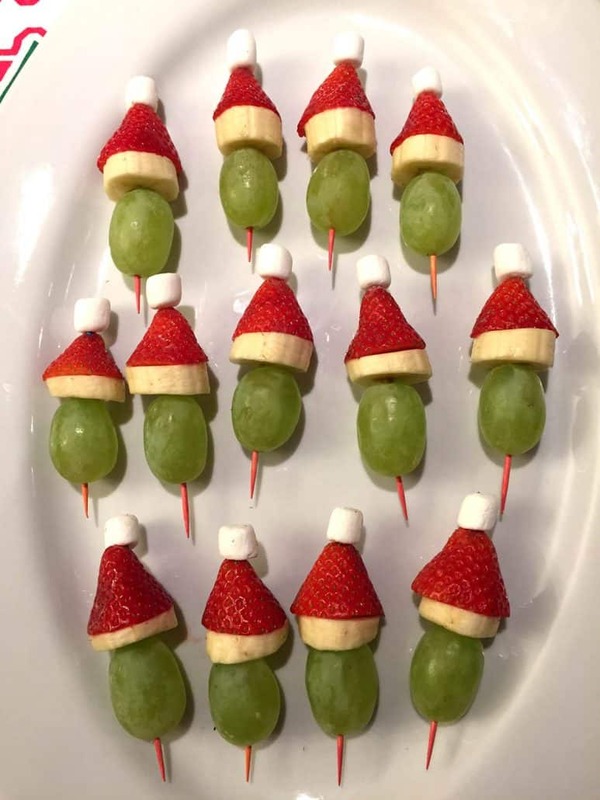 I don’t know about you, but I have a hard time getting my toddler to eat fruit, so when I came across a little Christmas craft that might get her excited to eat healthy, I was in! You’ll need bananas, strawberries, marshmallows, grapes and toothpicks to make this tasty treat. As any mom that has toddlers can attest, it’s best not to put breakable ornaments up on your tree where your toddler can reach them. So when I came across these sea salt dough ornaments I knew we had to try these! My toddler is fascinated with a rolling pin so rolling out the dough was definitely her favorite part! Oh, and if you don’t already have a kitchen stool for your toddler, put one on your christmas list now. It makes “helping” in the kitchen so fun! Thank you for including my button trees!